One week ago today, the Shadow Brokers (an unknown hacking entity) leaked the Equation Group’s (NSA) FuzzBunch software, an exploitation framework similar to Metasploit. In the framework were several unauthenticated, remote exploits for Windows (such as the exploits codenamed EternalBlue, EternalRomance, and EternalSynergy). Many of the vulnerabilities that are exploited were fixed in MS17-010, perhaps the most critical Windows patch in almost a decade. Side note: You can use my MS17-010 Metasploit auxiliary module to scan your networks for systems missing this patch (uncredentialed and non-intrusive). If a missing patch is found, it will also check for an existing DoublePulsar infection. For those unfamiliar, DoublePulsar is the primary payload used in SMB and RDP exploits in FuzzBunch. Analysis was performed using the EternalBlue SMBv1/SMBv2 exploit against Windows Server 2008 R2 x64. Step 0: Shellcode sorcery to determine if x86 or x64, and branches as such. Step 1: Locates the IDT from the KPCR, and traverses backwards from the first interrupt handler to find ntoskrnl.exe base address (DOS MZ header). Step 2: Reads ntoskrnl.exe’s exports directory, and uses hashes (similar to usermode shellcode) to find ExAllocPool/ExFreePool/ZwQuerySystemInformation functions. Step 3: Invokes ZwQuerySystemInformation() with the enum value SystemQueryModuleInformation, which loads a list of all drivers. It uses this to locate Srv.sys, an SMB driver. Step 4: Switches the SrvTransactionNotImplemented() function pointer located at SrvTransaction2DispatchTable to its own hook function. Step 5: With secondary DoublePulsar payloads (such as inject DLL), the hook function sees if you “knock” correctly and allocates an executable buffer to run your raw shellcode. All other requests are forwarded directly to the original SrvTransactionNotImplemented() function. “Burning” DoublePulsar doesn’t remove this hook, just makes it dormant. Honestly, you don’t usually wake up in the morning and feel like spending time dissecting ~3600 some odd bytes of Ring-0 shellcode, but I felt productive today. Also I was really curious about this payload and didn’t see very many details about it outside of Countercept’s analysis of the DLL injection code. But I was interested in how the initial SMB backdoor is installed, which is what this post is about. Zach Harding, Dylan Davis, and I kind of rushed through it in a few hours in our red team lab at RiskSense. There is some interesting setup with the IA32_LSTAR MSR (0xc000082) and a region of the Srv.sys containing FEFE’s, but we don’t talk about such things… Much like the EXTRABACON shellcode, this one is crafty and does not simply spawn a shell. Inside the Shadow Brokers dump you can find DoublePulsar.exe and EternalBlue.exe. When you use DoublePulsar in FuzzBunch, there is an option to spit its shellcode out to a file. We found out this is a red herring, and that the EternalBlue.exe contained its own payload. The main payload is quite large because it contains shellcode for both x86 and x64. The first few bytes use opcode trickery to branch to the correct architecture (see my previous article on assembly architecture detection). Here is how x86 sees the first few bytes. You’ll notice that inc eax means the je (jump equal/zero) instruction is not taken. What follows is a call and a pop, which is to get the current instruction pointer. The inc eax byte is instead the REX preamble for a NOP. So the zero flag is still set from the xor eax, eax operation. Since x64 has RIP-relative addressing it doesn’t need to get the RIP register. The x86 payload is essentially the same thing as the x64 so this post only focuses on x64. 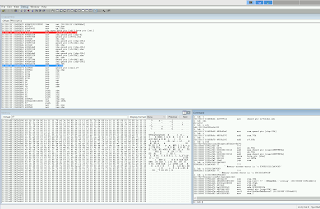 Since the NOP was a true NOP on x64, I overwrote the 40 90 with cc cc (int 3) using a hex editor. Interrupt 3 is how debuggers set software breakpoints. Now when the system is exploited, our attached kernel debugger will automatically break when the shellcode starts executing. Fairly straightforward code. 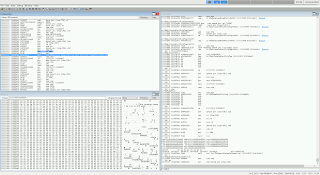 In user mode, the GS segment for x64 contains the Thread Information Block (TIB), which holds the Process Environment Block (PEB), a struct which contains all kinds of information about the current running process. In kernel mode, this segment instead contains the Kernel Process Control Region (KPCR), a struct which at offset zero actually contains the current process PEB. This code grabs offset 0x38 of the KPCR, which is the “IdtBase” and contains a pointer struct of KIDTENTRY64. Those familiar with the x86 family will know this is the Interrupt Descriptor Table. At offset 4 into the KIDENTRY64 struct you can get a function pointer to the interrupt handler, which is code defined inside of ntoskrnl.exe. 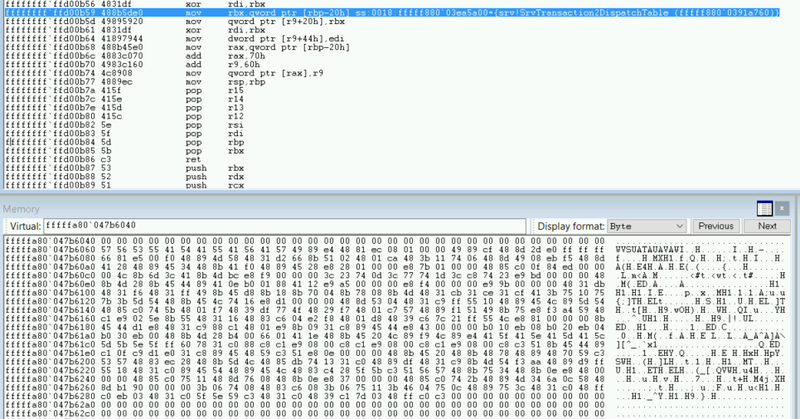 From there it searches backwards in memory in 0x1000 increments (page size) for the .exe DOS MZ header (cmp bx, 0x5a4d). Once you know where the MZ header of a PE file is, you can peek into defined offsets for the export directory and get the relative virtual address (RVA) of any function you want. Userland shellcode does this all the time, usually to find necessary functions it needs out of ntdll.dll and kernel32.dll. Just like most userland shellcode, this ring 0 shellcode also uses a hashing algorithm instead of hard-coded strings in order to find the necessary functions. 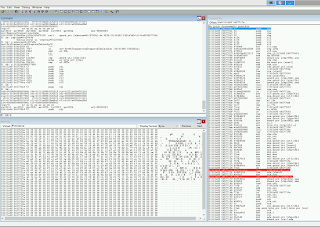 ExAllocatePool can be used to create regions of executable memory, and ExFreePool can clean it up when done. These are important so the shellcode can allocate space for its hooks and other functions. ZwQuerySystemInformation is important in the next step. A feature of ZwQuerySystemInformation is a constant named SystemQueryModuleInformation, with the value 0xb. This gives a list of all loaded drivers in the system. The shellcode then searched this list for two different hashes, and it landed on Srv.sys, which is one of the main drivers that SMB runs on. The process here is basically equivalent to getting PEB->Ldr in userland, which lets you iterate loaded DLLs. Instead, it was looking for the SMB driver. Now that the DoublePulsar shellcode has the main SMB driver, it iterates over the .sys PE sections until it gets to the .data section. Inside of the data section is generally read/write memory, and stored here is the SrvTransaction2DispatchTable, an array of function pointers that handle different SMB tasks. That’s it. The backdoor is complete. Now it just returns up its own call stack and does some small cleanup chores. Now when DoublePulsar sends its specific “knock” requests (which are seen as invalid SMB calls), the dispatch table calls the hooked fake SrvTransactionNotImplemented() function. Odd behavior is observed: normally the SMB response MultiplexID must match the SMB request MultiplexID, but instead it is incremented by a status code (with 0x10 being “success”). If you “knock” correctly, the backdoor will allocate an executable region of memory, copy over any shellcode you want, and run it. For instance, the Inject DLL payload in the framework is simply some DLL loading shellcode prepended to the DLL you actually want to inject. Another thing to note, when we “burned” DoublePulsar (sent it the “uninstall” command from the framework), it did not restore the original SrvTransactionNotImplemented() function in the SrvTransaction2DispatchTable dispatch table. Instead, the hook remained but merely laid dormant, jumping over its “knock”/shellcode running section. There you have it, a sophisticated, multi-architecture SMB backdoor. It’s a pretty cool payload, because you can infect a system, lay low for a little bit, and come back later when you want to do something more intrusive. It also finds a nice place in the system to hide out and not alert built-in defenses like PatchGuard.